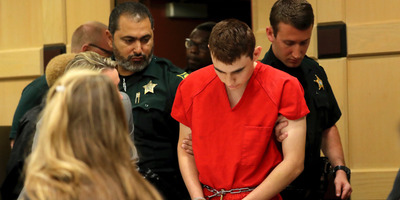 South Florida Sun-Sentinel via Associated PressNikolas Cruz appearing in court for a status hearing on February 19 in Fort Lauderdale, Florida. Jail records describe the suspect in the Parkland, Florida, shooting as being quiet but restless since the massacre. The suspect, Nikolas Cruz, is “cooperative” with jail officials and “responsive” to visitors, the records show. A grand jury indicted Cruz on 17 counts of first-degree murder on Wednesday. Nikolas Cruz has been locked in isolation at a Broward County jail since the shooting that left 17 people dead at a Parkland, Florida, high school three weeks ago. Cruz has spent most of that time in silence, cooperating with jail officials and his lawyers but speaking only when spoken to, according to records obtained by local media. A grand jury indicted Cruz on Wednesday on 34 counts related to the killing, 17 of first-degree murder and 17 of attempted first-degree murder. Cruz could face the death penalty if convicted, but his public defenders say he will plead guilty if prosecutors agree to a life sentence instead. But the jail records give some insight into Cruz’s behaviour since the massacre and how he’s being treated. Cruz has generally been “cooperative” with jail officials and “responsive” and “very engaged” when speaking with visitors. Jail officials describe Cruz as “logical and coherent” during interactions and appearing to be in “deep thought” when left to himself. Though he once refused a meal, he usually eats normally. One meal was described as two peanut butter and jelly sandwiches, an apple, cookies, and juice. Cruz takes medication, though it’s unclear what he’s being treated for. Police reports from 911 calls made to Cruz’s home before the shooting said he was medicated at the time for attention deficit/hyperactivity disorder and obsessive-compulsive disorder. Cruz’s visitors include family members, his attorneys, authorities, and doctors and psychologists. He was “talkative” during a February 20 meeting with his attorneys and a doctor. During one visit with his attorney, Cruz “appeared to break out in laughter both during and immediately following” the visit. A jail official marked the observation down as “awkward” behaviour. Cruz made only one request during the six days described in the records: a Bible to read. The jail has placed Cruz on suicide watch, a public defender told the South Florida Sun-Sentinel, though the jail records either redact or don’t include the information.